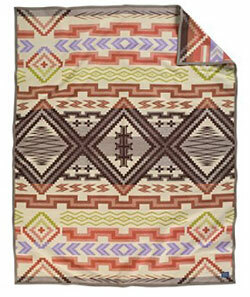 This design is Pendleton's homage to gatherings at the family cabin and weekends exploring nature. Pine tree and leaf motifs evoke memories of waking with the birds at dawn, and afternoons spent hiking the forest for a glimpse of its majestic wildlife, with the scent of pine in the air and needles crunching underfoot. Earthy and fiery shades recall evenings sharing tall tales around the campfire with stars shining overhead. 82% wool/18% spun cotton warp. Dry clean. Made in the USA. 64" x 80". Napped. Felt bound. 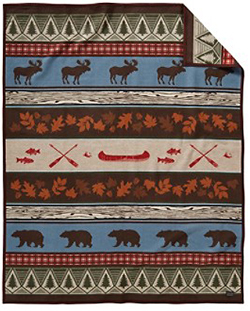 This framed blanket design is vintage 1923, first produced during the heyday of Trade blanket production. Arrows on the pattern indicate the paths of life and power. Stars centered in squares echo the bright morning star, a spirit honored among many pueblo dwellers. 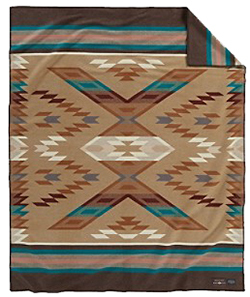 This blanket is robe size, the size preferred by Native Americans for ceremonial purposes and wrapping about oneself as a robe. Impressive as a wall hanging and practical when folded on a sofa or at the foot of a bed. Unnapped, felt bound. 82% wool/18% cotton. Dry clean. Made in the USA. Throughout, North American Indian folklore reflects the many stories surrounding animal spirits. Every animal has a reason for existence and a legend of how and why they are on Mother Earth. Raven is the counterpart of Coyote. Even though Raven can be an expert trickster, often fooling other animals out of food or shelter, Raven can also be a friend when other animals need help. With sharp eyes, he has a keen skill of knowing when danger lurks. Raven identifies the danger and notifies all other animals in the desert or forest to be cautious or to hide. Raven is a solid reminder and teacher of the good versus evil and is always available if there is a decision to be made. 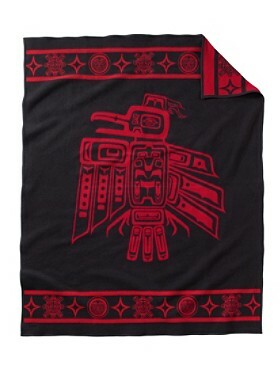 The Blanket exemplifies the black colored feathers of Raven; the red color of potential danger that surrounds him. 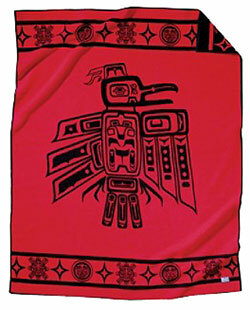 The blanket is bordered with the Sun, Moon and Stars that are celestial facets of Raven's life. 64” x 80”. Napped, felt bound. 82% wool/18% cotton. Dry clean. Made in the USA. 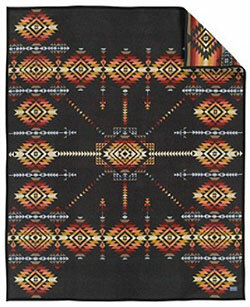 This pattern is discontinued by Pendleton. We have one available. 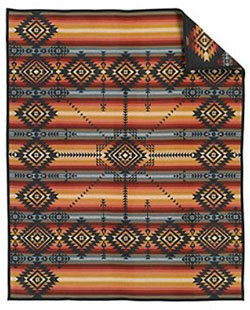 A made-in-America, Southwest-inspired wool blanket based on the work of Roselyn Begay. Begay is a Navajo/Dine artist living near Chinle, Arizona who has been weaving for more than 50 years. 64" x 80". Unnapped, whipstitch trim. 82% pure virgin wool/18% cotton. Dry clean. Made in the USA. It is said that Spider Woman taught the Diné (Navajo) to weave under the direction of her husband Spider Man. Generations of accomplished Navajo weavers have practiced their skill and shared their gifts with an admiring world. 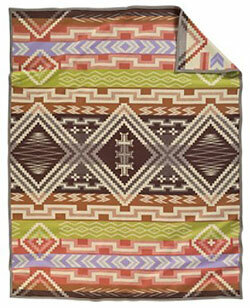 This intricate geometric design references a step in the evolution of Navajo weaving. The opening of the Santa Fe Trail in 1821 brought about many changes from the Classical period. By the 1860s new weaving techniques and available yarns contributed to more elaborate designs. Fine, silky-smooth 3-ply merino yarns from Saxony, Germany, were among those that were imported and began to supplement the natural fleece-colored yarns commonly seen. New yarns made possible exciting variations in colors and sophisticated patterns as seen in this blanket's elaborate terraced meanders, chevrons, zigzags, stepped diamonds and Spider Woman crosses. 64” x 80”. Unnapped, felt bound. 82% wool/18% cotton. Dry clean. Made in the USA.